Legislator Ellen W. Birnbaum in front of Nassau University Medical Center’s "mammovan." 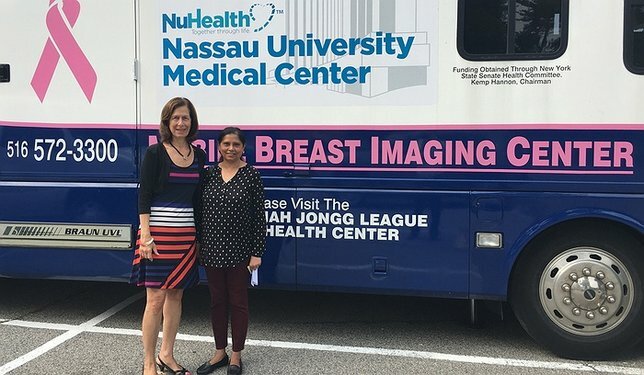 New Hyde Park, NY - July 18, 2018 - In partnership with NuHealth, Nassau County Legislator Ellen W. Birnbaum (D – Great Neck) is offering residents the opportunity for convenient, close-to-home breast examinations by bringing the Nassau University Medical Center’s “mammovan” to Clinton G. Martin Park in New Hyde Park on Wednesday, Aug. 15. There, patients can receive a breast examination from a nurse, a mammography, and instructions for self-examination. Individuals without health insurance may also be eligible for a no-cost examination through the Nassau Cancer Screening Program. Appointments are required. Call Legislator Birnbaum’s office at 516-571-6210 to schedule an appointment. Subject: LongIsland.com - Your Name sent you Article details of "Legislator Ellen W. Birnbaum Partners With NuHealth To Host “Mammovan” in New Hyde Park"